I’ve still got a cold. Last night I coughed myself awake – probably the whole neighborhood too. *sigh* I was talking with my mom this morning and she suggested I try my paternal Grandmother’s Cure-All for colds. It’s called a Guggle Muggle. I don’t know if it’ll cure my cold – but the way it’s looking now… WHO CARES? 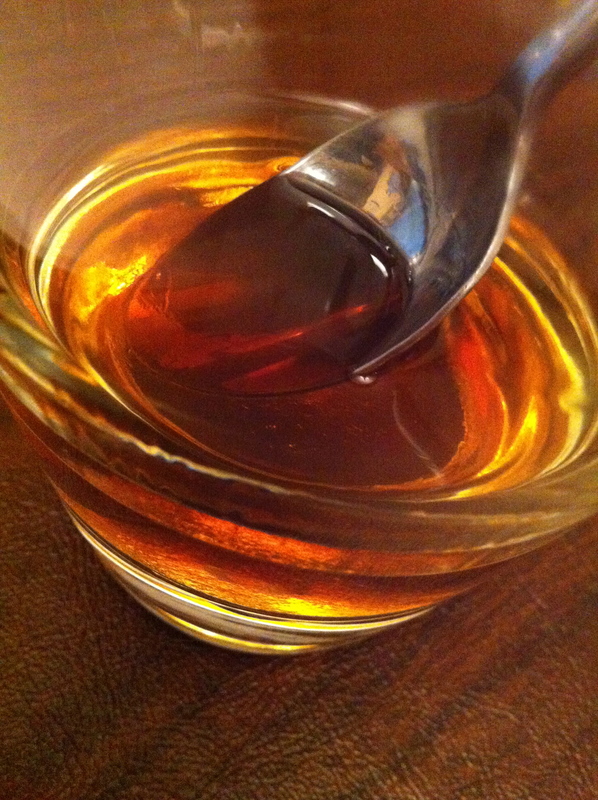 BTW- this is Macallan and Wildflower Honey. You know, just in case you wanna pour yourself one. Let me start by saying that the inspiration for this recipe came from a page out of Sunset Magazine – literally. I love reading recipe magazines and I’m always turning down the corner on recipes I wanna try that ephemeral ONE DAY. Sometimes I get around to making them…often not. Regardless, tonight I was trying to go through all my bent-corners and pull out recipes so I can sort them into *sigh* some sort of order. On one side of a page I found this delightful recipe for a Broccoli soup using Blue Cheese. Since I had neither I was about to file away the page when I turned it over. LUCKY DAY! 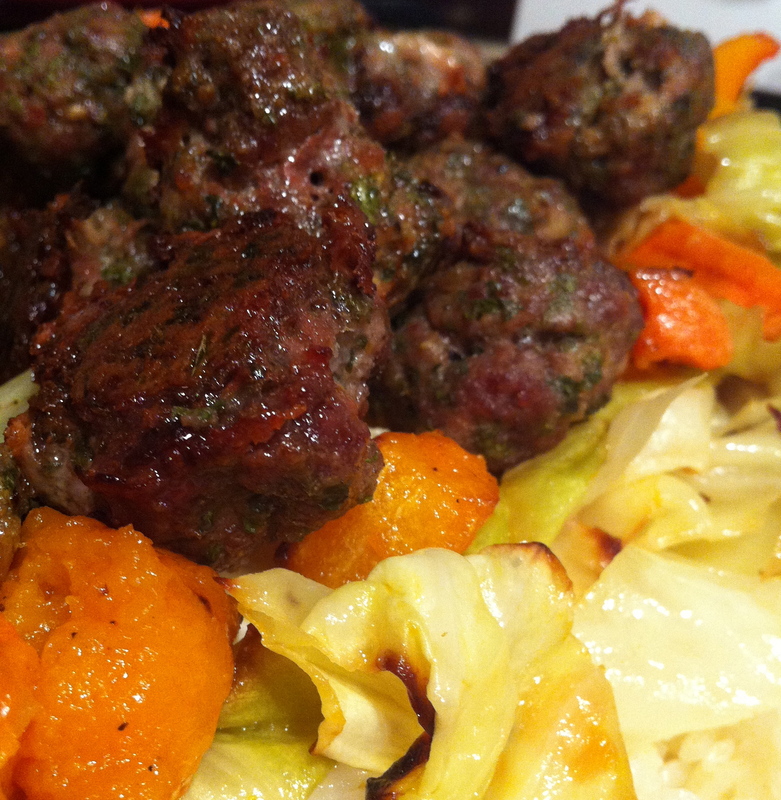 I saw the recipe for Roasted Vegetable and Mini Meatball Pappardelle. So I roasted the veg (each one on it’s own baking sheet) with olive oil, then seasoned with salt and pepper when they came out of the oven. I combined everything in a bowl and set it aside. 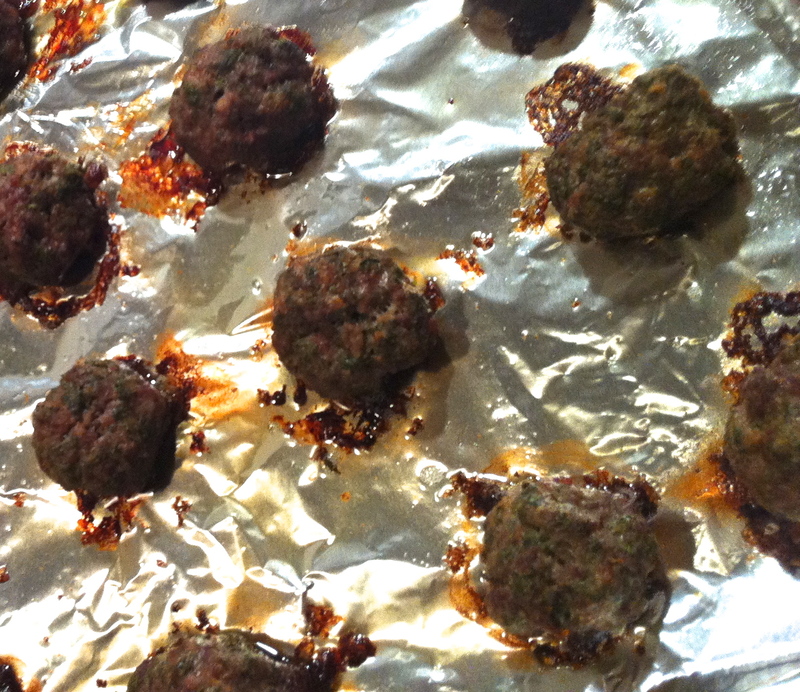 I mixed Dijon, lemon zest, parsley, thyme, breadcrumbs and an egg with a pound of ground beef and rolled out some mini meatballs – the pound made 28 little balls. SO CUTE! I baked them at 425 for about 25 minutes and then layered everything onto a platter and brought it to the table. C liked the rice and veg – but then suggested that next time I first look up the SUBSTITUTION AMOUNTS for dried parsley v. fresh. I used 1/2C of dried instead of 2.5T of dried. Turns out, you’re supposed to use 1/3 of the required amount and 1/3 of 1/2C is 2/5T. According to Google that is. That kind of math makes my head hurt. PASTA AND VEGETABLES **I didn’t make any of this stuff. Just including it here in case you feel like you want the original…you know, for inspiration. 1. Make meatballs: Mix ingredients in a large bowl to combine. Divide into 1-tbsp. portions; using wet hands, roll into balls. Chill on a baking sheet, covered with plastic wrap, until ready to use (up to 1 day). Preheat oven to 425°. 2. Prepare vegetables: Toss onion, garlic, and potatoes with oil and 1/2 tsp. each salt and pepper in a large roasting pan until evenly coated. 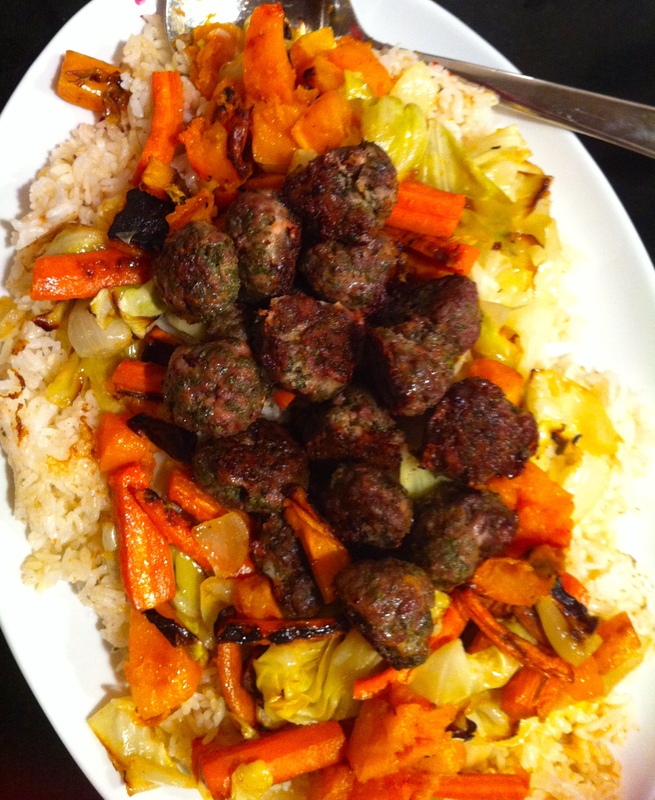 Nestle meatballs around vegetables and bake until onion and potatoes are tender and meatballs are cooked through, about 30 minutes. 3. Meanwhile, cook pasta according to package directions, adding peas during the last minute of cooking. Drain, reserving some pasta water, and return pasta and peas to pot. 4. 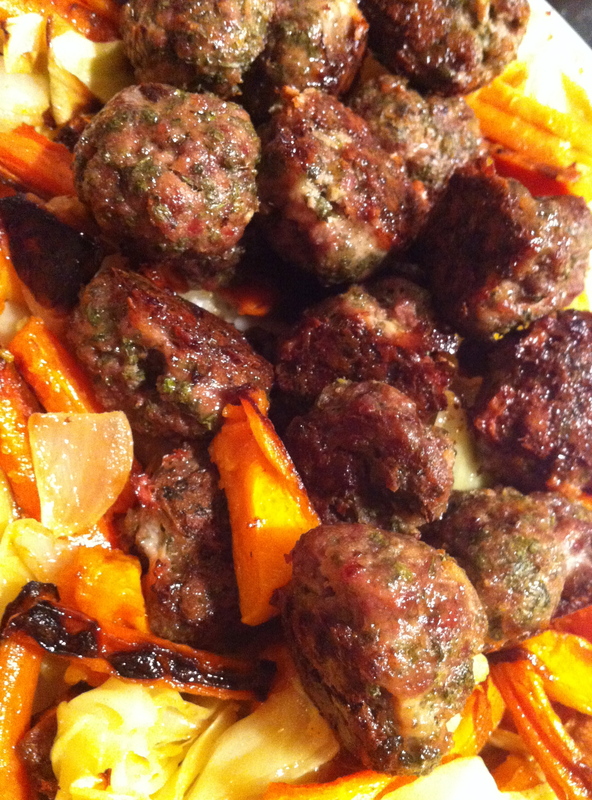 Stir wine into meatballs and vegetables and pour into pot of pasta. Add lemon zest and 3/4 cup parsley; toss to combine, adding pasta water if mixture looks dry. Season to taste with salt and pepper. Transfer to a plate; garnish with parsley. **I really only made the meatballs from this recipe. I roasted them on a tinfoil lined baking sheet at 450 for about 25 minutes. 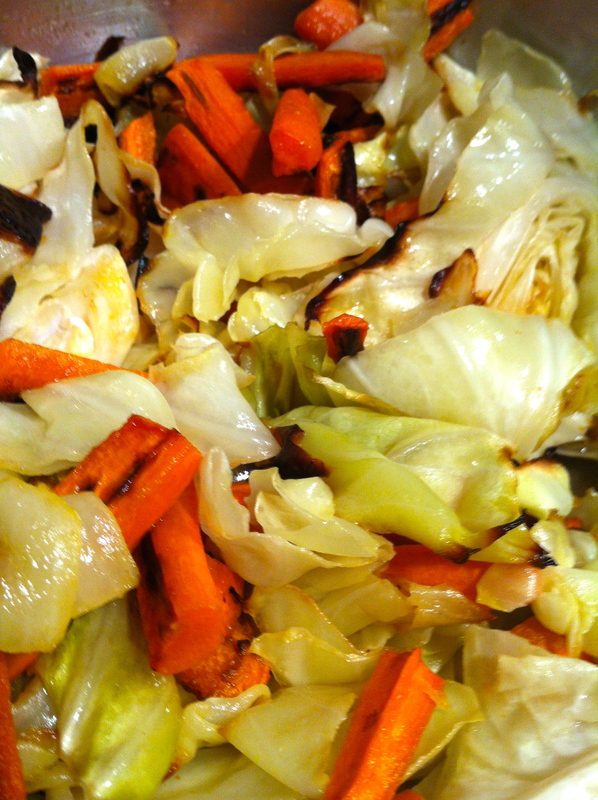 **I roasted the squash, carrots and cabbage on their own baking sheets with a little olive oil. I took the pans out after about 30 minutes, when I saw brown and crispy bits and I thought it smelled good. I tossed the veg with some salt and pepper and then scraped everything into a mixing bowl and set it aside. **I used 1C rice to 2C veggie stock in my rice cooker. It took about 30 minutes to cook. BTW #2 – I just googled Guggle Muggle recipe. Turns out the recipe was quite popular and has several variations, including some with raw egg, others with brandy… Ahh well. This one is already half drunk and I’m feeling less pain already. Huzzah! Officily I think you have to use a tea base for guggle muggle. But if it works,it works.